Wellington Service Rifle is one of the oldest such clubs in New Zealand and was established to promote competition with military firearms. 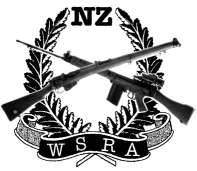 As part of the New Zealand Service Rifle Association, WSRA provides its members with advice, Range Officer training and also provides support for members to attend regional and national matches under certain criteria. WSRA shooters are usually very successful when "away" and we credit ourselves on providing regular varied shoots to help members develop their skills and encourage the use of multiple types of firearms. Monthly shoots are held, usually to a theme, which covers all manner and eras of modern military rifles from WW1 to present day. Matches are shot from 50 to 500 yds and vary in style and pace. Classes were introduced due to popularity of various arms so as to provide a level playing field. Some matches will see shooters prefer an AR15, whilst others require you to use a favorite bolt action .303, 6.5 Swede, 98 Mauser or even a .22 trainer. While predominantly a rifle club, we enjoy service shotgun matches and some pistol versions as well. Shotgun matches are typically speed shooting events on plates while hand gun matches vary between steel and paper. Rifle matches are typically 50-60 rounds in total and club days are broken into multiple events. Ample time is provided for practice or zeroing before each match and a briefing is held before the start of each match to ensure people are familiar with the course of fire being shot. Regardless of the theme, members are encouraged to compete with whatever firearm they wish as it promotes the building of skill and safety. At club matches, A category firearms are able to compete but as many of our members are E endorsed, you will find that these type of arms are common so we recommend you consider gaining you E endorsement as soon as possible. WSRA supports and endorses the Service Rifle Match Code which was created to set rules around modifications and changes to rifles. It remains our guiding document and is an excellent guide for new clubs to establish their own sets of rules. The starting out shooter should own a good .303 bolt action rifle in standard, as-issued state and an unaltered A category semi automatic such as an SKS or M305 Norinco M14. With these, the shooter will be able to compete in many matches until they decide to add more modern or expensive arms. We welcome all shooters so feel free to come along to any club shoot and see what we do.